San Pedro Creek Walking Dogs With such low traffic counts many residents frequently walk with the roads with ease and comfort. Vegetable gardens are popular in San Pedro Creek. San Pedro Creek Home SOLD! 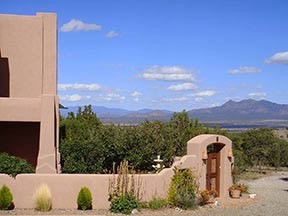 This is an example of a Santa Fe style mixed with some Soft-Contemporary. 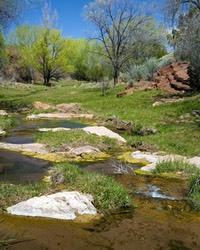 San Pedro Creek has 625-acres of open space. 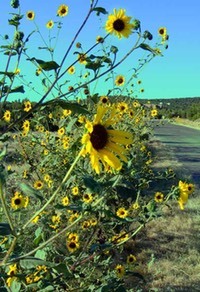 There is an additional 1500-acres with adjoining Golden Open Space & ABQ Open Space. 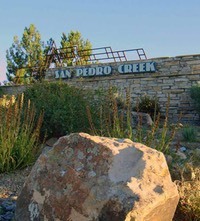 San Pedro Creek Estates (SPCE) is fully developed with three distinct phases. 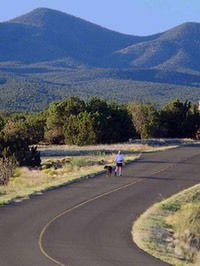 Depending on the site these ten-acre lots have magnificent views of of 7 mountain ranges: Sandia, Ortiz, San Pedro, Monte Largo, Sangre de Cristo, Jemez, and South Mountain. These sites feature paved private roads, underground electric/telephone. The property owner will have to provide their own individual well, septic system, and propane. The water situation in this area is excellent. There have been over 200 wells drilled in this area yielding over 15 gallons per minute on average. The quality of the water is tasteless like bottled water since it is tied into the natural spring fed aquifer. It has some hardness and residents sometimes choose a water softener system primarily to protect plumbing. The annual dues are approximately $1280, which primarily covers the maintenance of the private paved roads, snow removal, and some landscaping in the front. There are restrictive covenants that make sense to protect views and the integrity of the natural landscape. • The 10-acre homesites are not divisible. • Minimum size 1800 sqft (heated). • Maximum building height 26 ft on level lot, 19 ft for 15% or more grade. 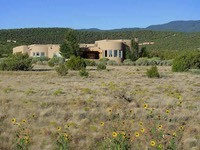 • Homes built on the high ridges must be positioned below the ridge line. 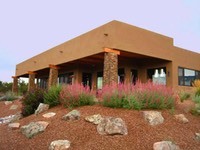 • Permitted Home Styles: Pueblo, Santa Fe, Soft-Contemporary and Territorial. • Exterior lighting: must be shielded and pointed downward with minimum wattage. • Horses allowed within a maximum of a 10,000 sqft coral area and the barn must match the style of home. • No manufactured homes of any type. • No perimeter fencing and no chain link. Fencing allowed: 5 ft or less of a natural material or matching stucco wall around home. • Pitched metal roofs must be earth tones. • Guest homes are allowed not to exceed 2/3 the size of the main home. Please Contact Us for a complete list of Design Guidelines updated in 2008.